Tell us how Neeku Naaku Dash Dash (NNDD) film materialize? Executive producer Ravi Anne approached me with the proposal. I was skeptial about the production house. I was not sure if I were going to get freedom from the producer. After a few weeks of dillydallying, I told them that I have a script for newcomers. Since producer owns Bhavya Cement, we named it as Bhavya Cement Actor Hunt and associated with Radio Mirchi. We received around 60,000 applications out of which we shortlisted around 2000. We had personal interviews with each of them and selected around 60 actors for various roles in this movie. We finalized two guys for the male lead and went for Prince because of his looks and personal attitude. We have finalized two girls and selected Nandita as she is a Telugu girl. But she was over-weight and had wrong tooth. I made her go through fitness program to slim her down and then sent to a dentist to extract a tooth. You have certain pattern in your movies. Is this a different one compared to your earlier works? 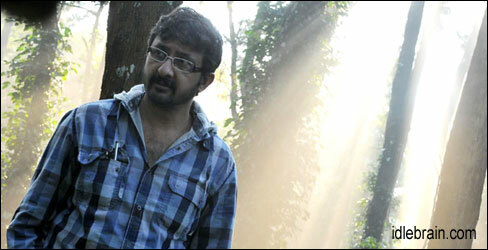 I am the same Teja who is directing and I have certain patten of thinking inbuilt in me. However, I have deliberately tried to be different. There could be similarity in screenplay. Your film deals with Liquor Mafia which is the hot topic for newspapers now? I have selected this liquor mafia backdrop 8 months before the newspapers started reporting about it. We were in the middle of the shoot when liquor mafia scam broke. I had gone to old city and did a lot of research about how liquor mafia works. I selected an actor for Bapineedu character (liquor mafia guy in film) and made him go bald though he had good hair. The censor officer objected because the kingpin in liquor mafia is a guy name Balaraju who also has a bald head. I had to convincer her by explaining the chronology of events for the production of this film. You will have a complete understanding of how state liquor mafia works after watch NNDD. Executive producer had apprehensions initially if the background of liquor mafia go well with crowds as it’s an alien subject, but felt happy after the scam broke down. Tell us about production house? Producer Anand Prasad and executive producer Anne Ravi are very good. They provided all the help without posing any questions once the project is locked. Surprisingly NNDD has got good vibes though you haven’t directed a film for years? Yes. There is warmth and craze for the movie in the market now. The agressive publicity also helped. When you have such positive vibes for the movie, there are more chances that the film will do well. The entire film is shot with red epic camera by Rasool. Incidentally, NNDD is the first complete red epic film release (entire film shot with red epic camera) in the world. You will also dont see regular Telugu cinema colors in NNDD. We had fixed on a color pallet and followed it. You dont see bright/vibrant colors of red, yellow and blue in the movie. All colors in NNDD are earthly. If we have to use an apple, we used green apple instead of red apple. NNDD is the 1st Telugu film to have 4k resolution. Earlier digital Telugu films had 1080 resolution. It will be a treat it you watch NNDD in a multiplex. I introduced music director, lyricists and singers with NNDD. There is also a 1st in sound department. NNDD is the first Telugu cinema to have 7.1 Dolby Digital Sound. Did you face any censor problems due to the usage of dash dash? I am a huge fan and follower of Tamil icon MGR. MGR films never had usage of liquor and tobacco. My films too never had any liquor and tobacco usage. All my films are clean without any vulgarity. Dash dash is used by heroine in film and she uses it as per the situations. It was used only to convey emotions of heroine. Censor people understood it and didn’t object. It is going to be a controversial film titled Dongalu (desanni dochuku tintunnaru). It’s a political thriller with a pinch of romance.